I resolved to do it and now I have done it. It took me a while to find my nearest House of Fraser shop. It took me even longer to find the bra bin inside the shop. That probably was just me trying to contend with a toddler who, like all males of his species, hates all things shopping. But I did it. I binned a great big bunch of bras that were cluttering up my lingerie drawer. All for a very good cause. A cause that is close to my heart for some very personal reasons. It was in support of Lorraine's Bin Your Bra campaign to raise money for Against Breast Cancer, a charity that is involved with breast cancer research. 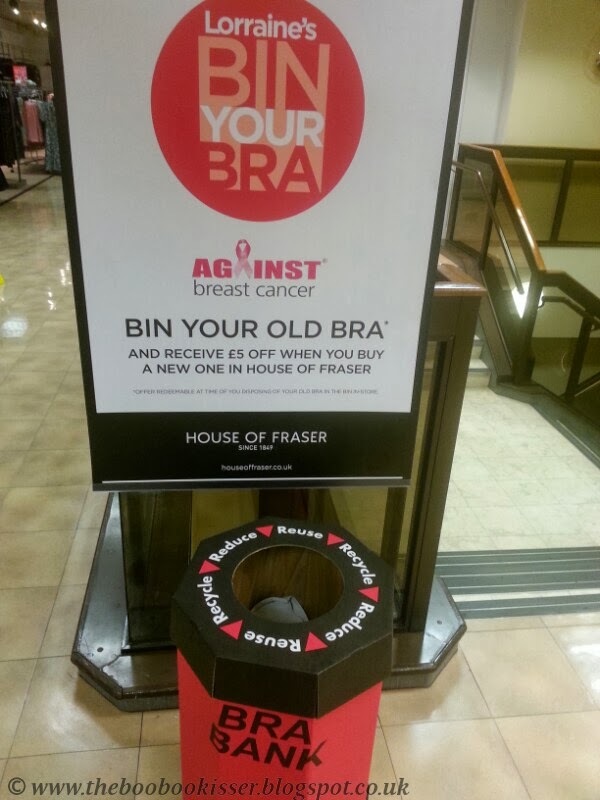 So ladies, and gentlemen with access to unloved bras, head to your nearest bra bin with your bagfuls. Certainly better than taking them to the landfill. There is no better time to declutter and support a worthy cause. ooh I really need to do this - perfect excuse to treat myself post nursing too! The House of Fraser was offering £5 off a new one. Just another reason to bin the old ones.